Does your company plan things correctly? Or are meetings unproductive due to poor planning? We continue our Leadership Hall of Fame series, a year-long look at the top business books and authors, with an excerpt from Getting Things Done (2001) by David Allen. You’re already familiar with the most brilliant and creative planner in the world: your brain. You yourself are actually a planning machine. You’re planning when you get dressed, eat lunch, go to the store, or simply talk. Although the process may seem somewhat random, a quite complex series of steps in fact has to occur before your brain can make anything happen physically. Your mind goes through five steps to accomplish virtually any task. But is the process describe above the way your committee is planning the church retreat? Is it how your IT team is approaching the new system installation? Is it how you’re organizing the wedding or thinking through the potential merger? If you’re like most people I interact with in a coaching or consulting capacity, the collective answer to these questions is probably not. What is the assumption here? Before any evaluation of what’s a “good idea” can be trusted, the purpose must be clear, the vision must be well defined, and all the relevant data must have been collected (brainstormed) and analyzed (organized). “What’s a good idea?” is a good question, but only when you’re about 80 percent of the way through your thinking! Starting there would probably blow anyone’s creative mental fuses. Trying to approach any situation from a perspective that is not the natural way your mind operates will be difficult. People do it all the time, but it almost always engenders a lack of clarity and increased stress. In interactions with others, it opens the doors for egos, politics, and hidden agendas to take over the discussion (generally speaking, the most verbally aggressive will run the show). And if it’s just you, attempting to come up with a “good idea” before defining your purpose, creating a vision, and collecting lots of initial bad ideas is likely to give you a case of creative constipation. If you’re like most people in our culture, the only formal training you’ve ever had in planning and organizing proactively was in the fourth or fifth grade. And even if that wasn’t the only education you’ve had in this area, it was probably the most emotionally intense (meaning it sank in the deepest). Mrs. Williams, my fourth-grade teacher, had to teach us about organizing our thinking (it was in her lesson plans). We were going to learn to write reports. But in order to write a well-organized, successful report, what did we have to write first? That’s right–an outline! Did you ever have to do that, create an outline to begin with? Did you ever stare at a Roman numeral I at the top of your page for a torturous period of time and decide that planning and organizing ahead of time were for people very different from you? Probably. In the end, I did learn to write outlines. I just wrote the report first, then made up an outline from the report, after the fact. That’s what most people learned about planning from our educational system. And I still see outlines done after the fact, just to please the authorities. In the business world, they’re often headed “Goals” and “Objectives.” But they still have very little to do with what people are doing or what they’re inspired about. These documents are sitting in drawers and in e-mails somewhere, bearing little relationship to operational reality. The unnatural planning model is what most people unconsciously think of as “planning,” and because it’s so often artificial and irrelevant to real work, people just don’t plan. At least not on the front end: they resist planning meetings, presentations, and strategic operations until the last minute. But what happens if you don’t plan ahead of time? In many cases, crisis! (“Didn’t you get the tickets? I thought you were going to do that? !” Then, when the urgency of the last minute is upon you, the reactive planning model ensues. What’s the first level of focus when the stuff hits the fan? Action! Work harder! Overtime! More people! Get busier! And a lot of stressed-out people are thrown at the situation. Then, when having a lot of busy people banging into each other doesn’t resolve the situation, someone gets more sophisticated and says, “We need to get organized!” (Catching on now?) Then people draw boxes around the problem and label them. Or redraw the boxes and relabel them. The reactive style is the reverse of the natural model. It will always come back to a top-down focus. It’s not a matter of whether the natural planning will be done–just when, and at what cost. 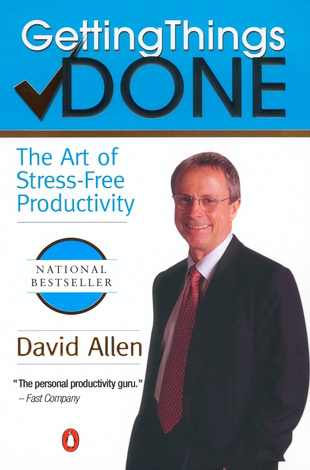 Reprinted from Getting Things Done: The Art of Stress-Free Productivity by David Allen, published by Penguin. All rights reserved.